I thought that I would take a break this week from neuroscience and other heady topics and discuss something about packing tips for the digital nomad lifestyle. When I was in Argentina the last time I had packed only one large bag and one very small North Face duffel bag for check in (combined weight about 30kg), and my laptop bag for carry-on. I was there for nine weeks and didn’t miss a thing. I was talking with the very good friend of mine about that and he remarked I should write about it. His thought was that it was a bit unusual that I could be gone from ‘home’ for that long and not miss stuff that I wish I had brought with me. Now I also have to admit that when I travel to move, that is obviously a little bit different than traveling just to be somewhere for a few days or a few weeks and then traveling again. But not greatly. It is more a matter of varying the amount of supplies one carries. Three areas really drive what I pack; cleanliness, supplies, and sundries. First and foremost, I am, hopefully this isn’t too strong a word, obsessively clean. So, when I travel, my concern is that I can change my clothes as often as I need without having to worry about where the next laundry is for a few days. For example, in Buenos Aires (and many other cities), when you take taxis, the vast majority of them are not that clean. And generally, after I’ve been out around for the day, I don’t even want to sit on any of my furniture at home after coming back. I almost will immediately shower and change as soon as I get back. And that applies in other countries as well. Especially if the climate is hot and humid, or very dusty, etc. What can I say? I just like being clean and fresh. The impact on packing is that I carry quite a few clothes with me. I try to stay with low volume, all cotton (for ease of laundering), and layering for colder climates. I'm always a little bewidered by people that say they can travel for several weeks in Asia with 1 small carry on. All I can say is I'd rather not be sitting next to them when they do. The second area of concern is supplies. Supplies are those products (personal hygiene, supplements, medications, etc.) that you prefer to be able to use. Depending on where you go, they may or may not be available. And so, you have to bring them along with quantities that reflect the length of your stays. For example, in Argentina, protein powder is hideously expensive, and you can’t find Worcestershire sauce. So, when I travel there, I do overpack with an extra bag that is generally full of supplies; protein powder, a large bottle of Worcestershire sauce, my various supplements and medications etc. The supplies list varies based on what country you’re going to but that is always one of my primary concerns when I pack. A note on medications. I don’t have much in the way of maintenance medications thankfully, but I like having the medications I prefer with me for stomach issues (Nexium, Imodium, Activated Charcoal), pain (Naproxene Sodium, Ultracet), and flu (Nyquil). Those are what work for me and regardless of where you travel, it is highly unlikely that you will be able to find what you prefer locally. And when you are sick, you don’t want to be out trying to find medicine at 2 in the morning in another language. Hence – the medication and a first aid kit – always with me. And I keep some in my carry-on and a duplicate set in checked luggage. Well, being a digital nomad, the laptop and phone stuff should be self-explanatory. I carry at least one extra external hard drive (that has a backup of all my data – and I have cloud backup as well), two power supplies for my laptop, one in carry-on, the other in checked baggage, and multiple device chargers (I really like the Anker brand – They have multiple ports and will power most devices at the maximum charge rate possible). Taking the phone chargers supplied with the phones or tablets are useless I believe. An Anker will supplant multiple chargers and do a better job. Again, one in carry on, one in checked. I carry a mini-USB hub and docking station as well. Both are shown in the photo at the top of the article. Toolkit. Indispensable. A few folding knives, multi-tools (Leatherman), powerful mini-flashlight (LED 600 lumens), screwdrivers, a small toolkit that I have found, that no matter where I go in the world, it always can serve my needs. A small bottle of cleaning fluid, lint free 3M cloths, and a nylon brush for cleaning. I picked up a couple of handy cases for tools (pictured below). Tools just don’t mix well with packing cubes. And I use socks or thin T-Shirts in the cases to eliminate rattling. Writing materials. This is particular to me, but I do write with pen and paper quite a bit. I ran out of both my high-quality pens (that I usually buy in Thailand) and filled up my good notebooks while I was in Argentina the last time. It was extraordinarily difficult to find a good quality pen. And all the notebooks that I bought in Argentina, had a generally inferior quality of paper. The most annoying thing was that there were portions of the paper on various sheets, at random, where the pens would not write. Yes, call me OCD if you wish, but I found that extraordinarily irritating. I happen to really like stone paper notebooks. It is a superb writing surface and lasts seemingly forever. Stone Paper: …paper-like product manufactured from calcium carbonate bonded with high-density polyethylene (HDPE). It may be recycled with Number 2 plastics or remade into Rich Mineral Paper again and is not biodegradable but is photo-degradable and compostable under commercial conditions... has a number of advantages over traditional paper made from wood pulp. Stone Paper collects no static charge, is acid-free with a neutral pH, has no grain, is water, grease, and insect resistant, and tears with difficulty due to a latex-like texture. And, as a compulsive list maker, I make sure that I start packing for my long sojourns in Argentina approximately two weeks before I go. I make my list, and I check it not twice but probably 20 times while I’m packing to make sure that I get everything that I need. Even for my shorter trips I start packing about 2-3 days prior, use a checklist and packing cubes. Really helps to not forget that item that you will miss. I do try to be very complete about what I bring with me. In my earlier years when I traveled, whenever I forgot something I would just buy what I forgot in the country or countries that I was traveling to. Over the years I ended up having multiple copies of quite a few different items that I didn’t need. These days, I abhor waste. Not to mention that it is needlessly expensive to buy extra copies of things that you just forgot to bring along. So, I do try to be very comprehensive about items like spare computer parts (especially in Argentina anything computer-related is again, very expensive), supplements, tool items, hands, notebooks, etc. It just makes the trip ever so much less stressful. Having gone through all this, I will admit that there is one thing that I find I do miss when I travel. I have a nice 13-inch laptop, however, at home, I use a 29-inch monitor with it. I find it aids my productivity to an extraordinary degree. I do a lot of work on spreadsheets and databases, plus writing and I find that having a large screen to work on and using the organic laptop screen as an auxiliary screen really helps me out. On my next trip to Argentina I am probably just going to buy a monitor that will I will use for four months and at the end of that time I’ll see if I can leave it with somebody so I can use it again next year. The other option that I have been exploring, and I plan to pick one up the next time I go to Hong Kong, is one of those very small HD LED projectors. My thinking is that if I have one of those I can always project onto a convenient wall in a room in order to be able to get a second larger screen. However, the only way I can really think of to evaluate this is to buy one and experiment. For my upcoming 4 month stay I’m taking an additional Victorinox rolling check-in. That will hold most of my supplies like protein powder and coffee 😊. It will travel light on the way back. 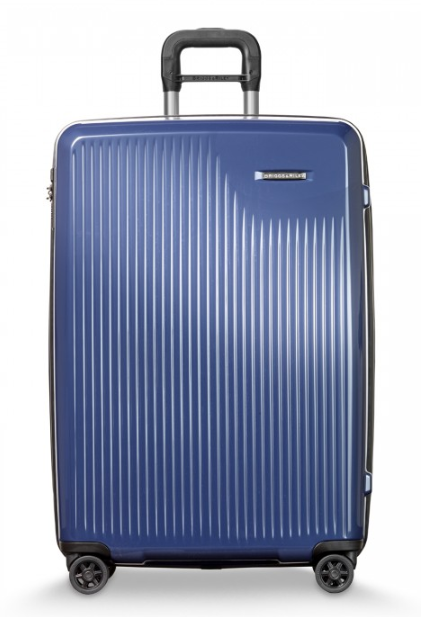 Briggs & Riley carry-on [International Spinner TORQ] – Has a outside compartment for laptop - Briggs and Riley has a lifetime warranty. I don't know how good it is because in 10 years of having them, I've never had to use it. And – impulse purchase but I love it, a Tumi Alpha Bravo laptop briefcase. I thought I could make do on board with just the Briggs & Riley Spinner, but I carry too much IT stuff. 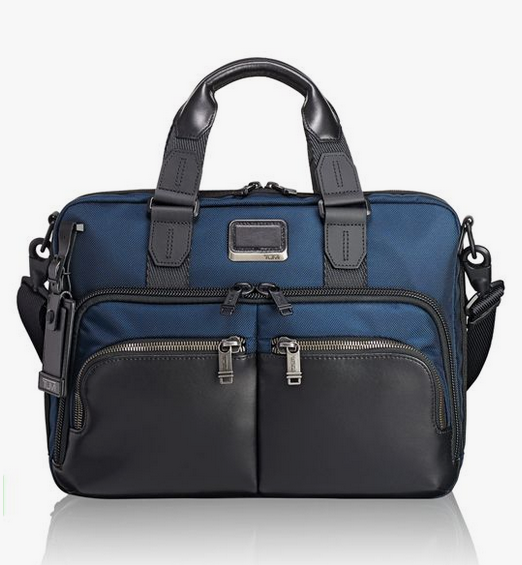 The Tumi soft briefcase is perfect and allows faster access to critical items on board. Really excellent combination. 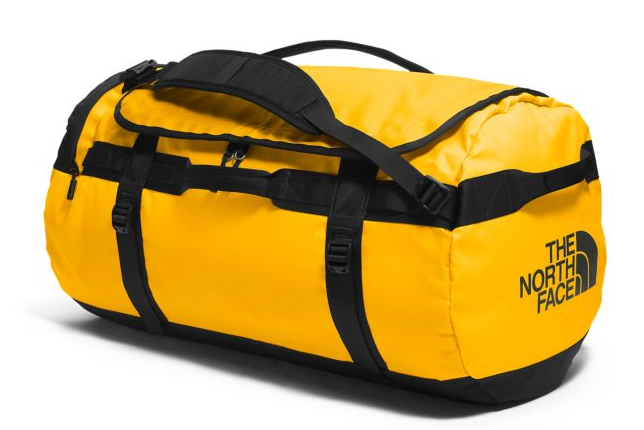 And for overflow, I very much favor this line of North Face bags (yellow bag above). Really rugged. They have from toiletry bag size to extra-large duffle in this design with numerous different colors. Well worth the purchase. Packing Cubes – Eagle Creek and Amazon Basic seem to work well.